Mountain biking, once considered a “fringe” or “extreme” sport, has taken hold as a popular and exciting outdoor activity in recent years. Its inherently challenging and physically demanding nature makes mountain biking more than just a hobby for many of those who participate. For the beginner, figuring out mountain biking techniques can be a pretty daunting task. Because navigating outdoor terrain is so different from just riding down the street, you essentially have to re-learn the basics of biking in order to become proficient on the trail. Use this quick and basic guide to help flatten out that learning curve and get the wheels spinning with your newfound mountain-biking hobby. 1. Get the necessary mountain biking equipment. To start off with, you’ll probably want to invest in the bare essentials of mountain biking. This includes a mountain bike (preferably one with manual gears), a helmet, and mountain biking shoes. Other strongly recommended items are a few tough water bottles, heavy-duty biking gloves to prevent mangled hands after nasty spills, and a spare inner tube in case of a blowout on the trail. If it’s your first time looking at bicycling equipment, it might be a good idea to head to a specialty shop as opposed to a chain discount store. Knowledgeable sales staff in smaller stores will be able to help find the right gear to suit your mountain biking needs. 2. Learn basic maneuvering and techniques. The most basic difference between mountain biking and road biking is the use of gears. When climbing hills, you’ll want to keep your gear setting low, which lowers the number of wheel repetitions per pedal motion – making it much easier to maintain forward momentum. Experienced mountain bikers call this hill-conquering technique “spinning”. When taking turns, brakes are just as important as steering. 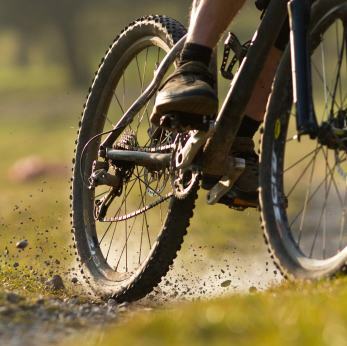 To prevent loss of grip through the turn, mountain bikers learn to brake before the actual curve, and take advantage of centrifugal force when making the turn. Also called “constant cornering”, it is based on the idea that accelerating through a curve prevents your bike’s tires from skidding off the trail. The final basic technique unique to mountain biking is forward and backward balance. In most riding situations, you’ll need to have your weight shifted towards the back of the bike. This will give your back tire much more traction and accelerating power. 3. Follow mountain biking rules and etiquette. Just as there are rules of the road, there are also certain rules of the trail that every mountain biker should follow. When passing hikers, you should either slow down or walk your bike past them to maintain a safe overall environment. Similarly, use your mountain bike’s bell to warn other bikers and hikers when you’re merging onto a new trail. From an environmental perspective, it’s also important to preserve the trails you ride on. This means no powering through large mud patches (this causes lots of erosion), or venturing into blocked off areas. With the right equipment, techniques, and etiquette in place, you’ll be well on your way to becoming a proficient mountain biker in no time. This intense sport, though not exactly for the timid, is a great way to stay active and enjoy the outdoors in a somewhat unconventional way. Get the tips but we need a place to practice them too. Trails centres are ideal for beginners because they have trails graded by difficulty; green are the easiest, blue are a bit harder, then up to red and then black. They will also usually have parking facilities, toilets, a cafe and bike shop which will also often do bike rental. Awesome tips. For me, one thing we need to do to master mountain biking skills is to go everywhere. The more time that you spend on your bike, the better you will get. Ride to the mailbox, to the store, to the coffee shop. This will help to reinforce your riding skills as you ride up and down curbs, dodge potholes and outpace angry chihuahuas. Once you can easily ride down two or three stairs, you can approach trail obstacles with a little more confidence. Being in love with biking for 5 years, I am now glad to conquer a long list of paths in US. 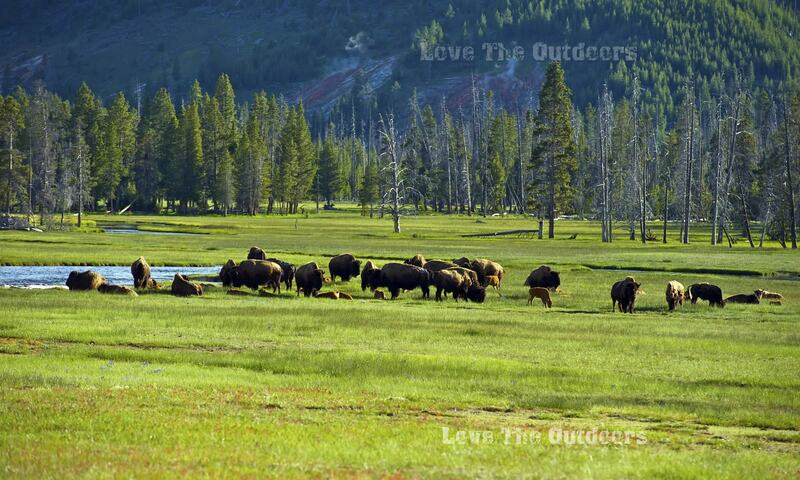 Love the trips, love the outdoor landscapes. Thanks for this quick writeup. I have always contemplated taking up mountain biking, but now that I have decided too, this short guide helps a lot. I have never heard of “spinning” and never thought that there would be mountain biking etiquette. I’m heading to a shop today to look at bikes! Cheers! Biking is awesome! Your tips will help a lot of beginners. Thanks for writing it. Mountain biking is my go to sport when I go out camping with friends and I like your introduction. Choosing the right bike is key, unfortunately people most often go for the cheap option which is something they tend to regret on the long run. Your tips on the necessary biking equipment are key. I recently got into riding some pretty bumpy single track trails. After my first ride following a friend down who has a full suspension bike, I realized my hard tail was not good enough. My back was out for 2 days afterwards. The next time down the same trail I borrowed a friends full suspension bike and what a difference. Super fun ride down and no back issues at the end. There is something to be said for having the right tool. We are new as well and just purchased bikes. It has been difficult in our area to find dedicated places to mountain bike. But we have not given up! Love it so far. My partner and I have recently bought bikes at first simply we thought it would be a good way to get fit as we are not getting any younger. Happily for us as soon as we started riding we were hooked. It is simply a great way to get out into the bush and yes it does also get you fit .